AFP Manitoba is concerned with the role and the image of philanthropy in this province. And we are dedicated to serving the professionals and the organizations that make this industry successful. 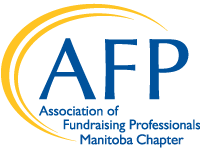 In fact, AFP Manitoba has been supporting the work on Manitoba’s fundraising professionals for over 20 years. And we have developed a suite of member benefits, services and tools that will help you in your career. Find out more by contacting us at info@afpmanitoba.org.